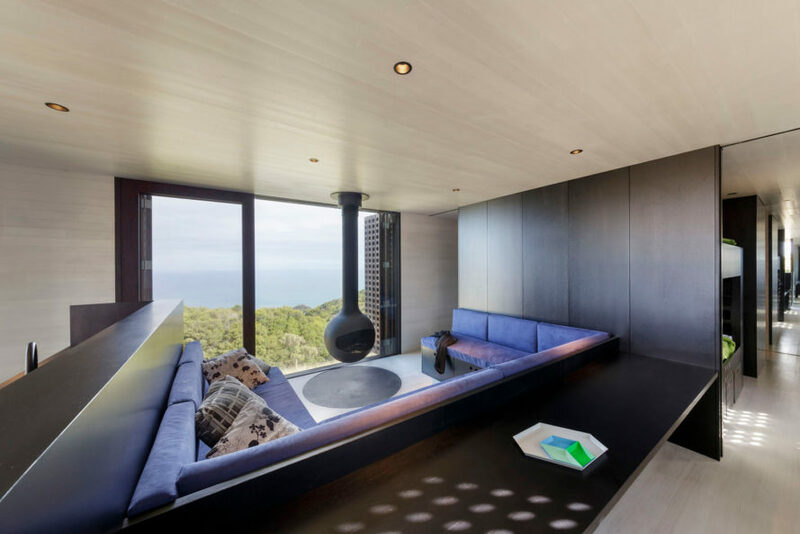 Australian architect Jackson Clements Burrows designed this gorgeous retreat cabin to overlook a windswept bluff near the ocean in Western Victoria, Australia. From the outside, the Moonlight Cabin is a modest-looking home, not flashy or overbearing in its natural setting. Completed in 2014, the cabin is clad in louvered movable panels that enable the homeowners to change the conditions of the cabin on a whim—from a tightly sealed fortress to an open air living space to any point in between—just by opening or closing the walls. Tucked within its small footprint is a treasure trove of luxuries, all designed to house a small family on vacation. The cabin spans a humble 645 square feet (60 square meters) and includes a fully appointed kitchen and bathroom. In the main living area, a giant U-shaped built-in sofa provides maximum lounge space and a spectacular view from a floor-to-ceiling window, obscured only slightly by a suspended wood stove. The home’s interior is fitted with Victorian ash timber linings coated with limed wood wash, which surround the space in elegant, contemporary style. The minimal interior design and restricted palette create a tranquil environment for relaxation, while carefully selected sustainable materials make the Moonlight Cabin as cost-effective as it is attractive. 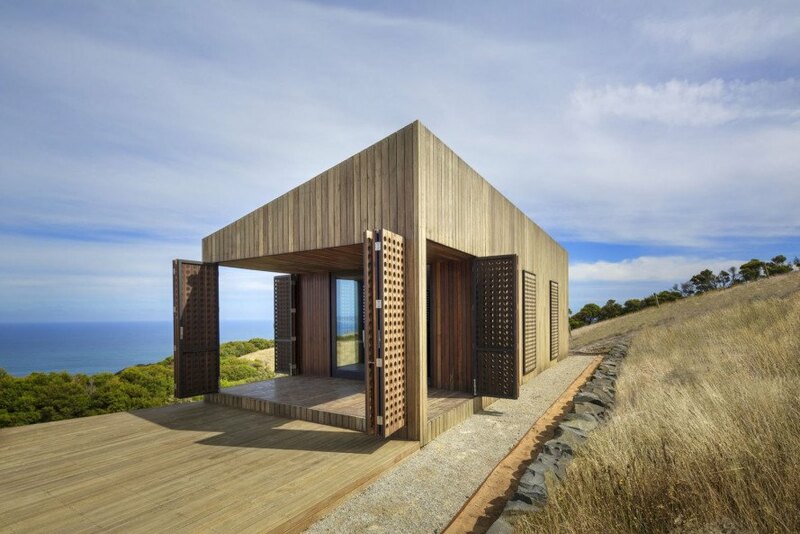 The architects chose Spotted Gum for the cabin’s exterior panels, a native Australian variety of eucalyptus hardwood. The sustainable material is often used in flooring, but here demonstrates the same durable features, particularly the ability to expand and contract naturally in the changing climate. Shutters invite cross-ventilation, as well as offer the homeowners a bevy of privacy options. The shutters can be positioned to open up the interior space to the out-of-doors, or closed to ensure security and safety in the event of a storm, or when the owners are ready to pack up and go back to their primary home overseas. The "Moonlight Cabin" is tucked within a small footprint, and includes treasure trove of carefully-though-out details, all designed to house a small family on vacation. The Moonlight cabin spans a humble 645 square feet (60 square meters) and includes a fully appointed kitchen and bathroom. Jackson Clements Burrows architects chose Spotted Gum for the cabin’s exterior panels, a native Australian variety of eucalyptus hardwood. The sustainable material is often used in flooring, but here demonstrates the same durable features, particularly the ability to expand and contract naturally in the changing climate. In the main living area of the Moonlight Cabin, a giant U-shaped built-in sofa provides maximum lounge space and a spectacular view from a floor-to-ceiling window, obscured only slightly by a suspended wood stove. The home’s interior is fitted with Victorian ash timber linings coated with limed wood wash, which surround the space in elegant, contemporary style. The minimal interior design and restricted palette within the Moonlight Cabin create a tranquil environment for relaxation, while carefully selected sustainable materials make the cabin as cost-effective as it is attractive. The movable shutter-like walls of the Moonlight Cabin allow for cross-ventilation, as well as offer the homeowners a bevy of privacy options. The shutter walls can be positioned to open up the interior space to the out-of-doors, or closed to ensure security and safety in the event of a storm, or when the owners are ready to pack up and go back to their primary home overseas.